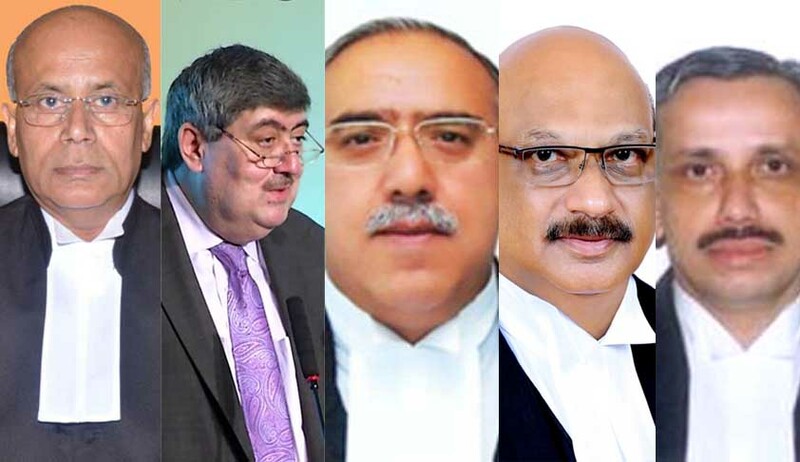 Rajasthan High Court Chief Justice Naveen Sinha, Madras High Court Chief Justice Sanjay Kishan Kaul, Chhattisgarh High Court Chief Justice Dipak Gupta, Kerala High Court Chief Justice Mohan M Shantanagouder and Karnataka High Court judge Justice S Abdul Nazeer are to be sworn as Judges of Supreme Court of India on Friday. Justice Sanjay Kishan Kaul graduated in Economics (Hons.) from St Stephens College, Delhi University in 1979 and later obtained LLB from Campus Law Centre, Delhi University in 1982. He was appointed as the Chief Justice of Punjab and Haryana High Court in June 2013 before being sworn-in as Chief Justice of the Madras High Court in 2014. His recent ruling upheld the freedom and expression and led to the ‘resurrection’ of Tamil writer Perumal Murugan. Justice Mohan M. Shantanagoudar enrolled as an Advocate on 05.09.1980. He practised for one year at Dharwad in the Chambers of Sri I.G.Hiregoudar, Advocate before shifting practice to Bengaluru. He joined the Chambers of Sri. Shivaraj V. Patil, Advocate (as he then was), who later adorned the Supreme Court of India. He started independent practice in the year 1984. He served as Vice-Chairman of Karnataka State Bar Council from 1991 to 1993 and as Chairman of Karnataka State Bar Council during 1995 and 1996.He also served as State Public Prosecutor of Karnataka State from 1999 to 2002. He was appointed as Additional Judge of the Karnataka High Court on 12.05.2003 and as Permanent Judge on 24.09.2004. He assumed charge as Acting Chief justice of Kerala on 01.08.2016 and sworn in as the Chief Justice of the High Court of Kerala on 22-09-2016. Justice Dipak Gupta was born on 7th May, 1955 in Nurpur in Kangra District in a family of lawyers. He got Law degree from the Delhi University in 1978 and started practicing in the High Court of Himachal Pradesh from 1978 and continued till 2004. He was elevated as Judge of the High Court of Himachal Pradesh and administered the oath of office on 4th of October, 2004. He remained Acting Chief Justice of the Himachal Pradesh High Court twice, i.e. from 03.06.2007 to 10.07.2007 and thereafter from 24.11.2007 to 09.12.2007. He was the first Chief Justice of Tripura High Court later he was transferred and took oath as the Chief Justice of Chattisgarh High Court on 16.05.2016. Justice Abdul Nazeer was born on 05.01.1958. He enrolled as an Advocate on 18.02.1983. He was appointed as an Additional Judge of the Karnataka High Court on 12.05.2003 and as a Permanent Judge on 24/09/2004.